Palm Beach Gardens, Fla. – Remy Harwood, Fitness Specialist at Devonshire at PGA National, an Erickson Living managed retirement community located in Palm Beach Gardens and situated on a scenic 28-acre campus on the grounds of prestigious PGA National, works with many Community Members at Devonshire in the Fitness Center! She does one-on-one training sessions with community members every day while also teaching Exercise Group Classes consisting of balance, strength, and stretch along with Aquacise classes in the pool at Devonshire. Devonshire Community Member Lois Wolf is very active in the Fitness Center. She has one-on-one training sessions with Remy once a week where they focus on upper/lower body strength, balance along with some cardio. About Devonshire: Devonshire, one of 20 continuing care retirement communities managed by Erickson Living®, is situated on a scenic 28-acre campus on the grounds of prestigious PGA National. The community is located in Palm Beach County and is home to more than 350 community members. Additional information about Devonshire can be found at DevonshirePGA.com. 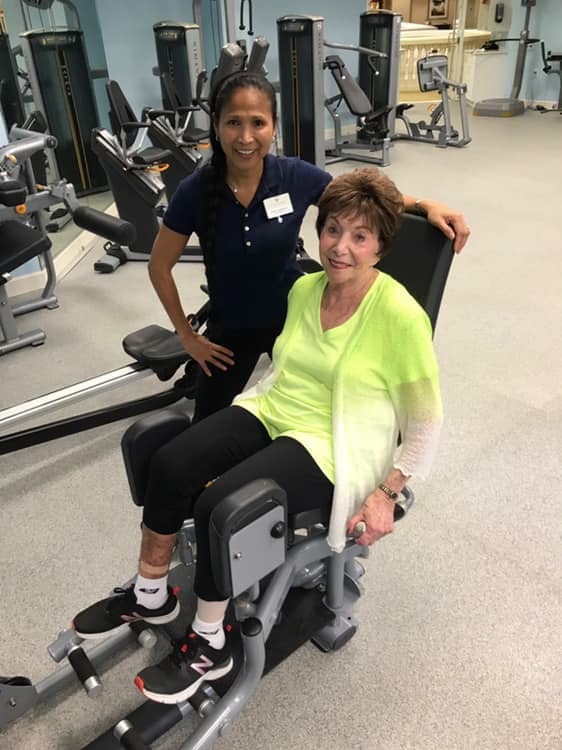 Photo: Remy Harwood, Fitness Specialist at Devonshire working one-on-one with Devonshire Community Member Lois Wolf in the Devonshire Fitness Center.